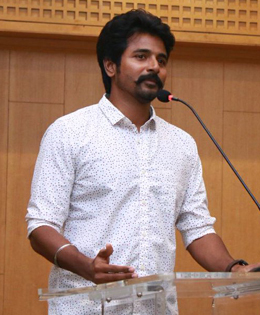 Actor Sivakarthikeyan has resolved to do at least two films in a year, which he revealed recently at a gathering. The star did not have a release after Remo, which hit the screens in 2016. Siva Karthikeyan who greeted his fans with Diwali wishes, urged the children to be safe while using crackers. Over his disappearance from public for so long, the actor said, "It has been more than a year since I met the press people. I apologize for the delay. The movies I picked had deep scripts and shooting went up to 150 days which is why I couldn’t get back to back releases. However, from 2018 I plan to release at least 2 movies every year for my fans." Fans are eagerly waiting for the upcoming release of Siva, Velaikkaran. The actor has paired with Nayanthara and Fahadh Fazil for the movie. Directed by Mohan Raja’s, the flick is slated to release on 22nd December this year. Meanwhile, the actor has Ponram’s film lined up. It will mark his third collaboration with the filmmaker after Varuthapadatha Valibar Sangam and Rajini Murugan. According to sources, the film will have plenty of action scenes, unlike in their early films. Samantha will play the female lead in this project.